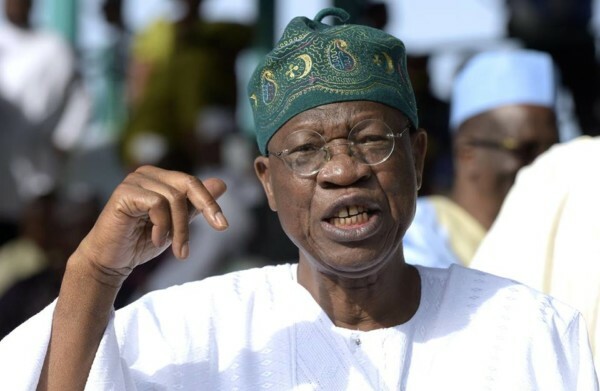 The Minister of Information and Culture, Alhaji Lai Mohammed, has said that as far as Federal Government appointments to public offices and key positions are concerned, the era of “godfatherism’’ is over. The minister stated this in Abuja on Sunday at a Thanksgiving reception by the newly appointed Permanent Secretary in the Ministry of Information and Culture, Ms Grace Gekpe. Mohammed, who was represented by Mr Bayo Onanuga, the Managing Director of the News Agency of Nigeria (NAN), stated that appointment to positions in the Federal Government “is strictly by merit." “Gone are those days when people were appointed into positions by other factors apart from merit. “Most of us must have heard that the new permanent secretaries were asked to write examination; Gekpe was one of the very few that scaled through the examination. Gekpe is a shining and beautiful woman. That could have earned her the appointment, but not under this regime of Change. “She is a permanent secretary by virtue of hard work, merit and because she has a lot of things to offer,’’ he said. The minister said that the ministry was proud of Gekpe, satisfied with her appointment and wished her all the best. Mohammed underscored the need for improved funding for the Ministry of Information and Culture and its parastatal agencies. “The Ministry of Information and Culture has a very big responsibility and there is the need for sufficient funding for it and its agencies. “The government is doing a lot of things, but it is being misrepresented by naysayers. “This is the time that the government needed to raise an army of competent information managers to counter the false and negative narratives about the administration,’’ he said. He also underscored the need for the upward review of the retirement age of journalists working in the Ministry of Information. “They are like judges and university professors; like old wine, they get better with age,’’ he added. The Head of Civil Service of the Federation, Mrs Winifred Oyo-Ita, said the position of permanent secretary “is the highest level any civil servant can dream to reach in the public service’’. She enjoined Gekpe to present her life and tenure to God for wisdom and guidance and as well show understanding and loyalty to her minister and the administration. Oyo-Ita said: “She is called to serve the nation and in doing this, she should face her duties with dignity, integrity and understanding that this is a government of change, it cannot be business as usual. “She has to be an epitome of incorruptibility, she should be efficient, productive, and be a citizen centred-permanent secretary’’. In a brief remark, Gekpe said her appointment was a call to serve the country. She pledged to discharge her responsibilities with the fear of God and in support of the government’s programmes. “I will put in my best to assist my immediate boss, the minister, and the government at large to achieve the agenda set for the country,’’ she said. A thanksgiving service was held at the Living Faith Church, Jahi District, before the reception. The event was attended by heads of parastatals and agencies in the Ministry of Information and Culture and representatives of the Government of Cross River.